1. i am so not a night person, i hate to stay up late... and to me, anything past 9:00 is late! 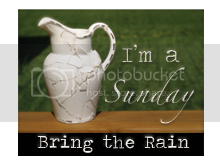 but i am a morning person, once i get my hot shower i am good to go! 2. i am a very picky eater... i do not eat most vegetables. especially nothing green, including salads of any type. i HATE the thought of something crunchy like that in my mouth. so my diet is very unhealthy, def. not balanced AT ALL. i could live off starches, my favs are mac n cheese or pasta of any type, rice and mashed potatoes. i know, i'm wierd. i like things PLAIN, as in ketchup only, that's the only condiment i like. again, WIERD, i know! 4. i NEVER thought i would drive a mini-van at the age of 25. BUT we came across a GREAT deal back in april and every since then, i drive it proudly! it is so comfortable and spacious, esp with 3 carseats in the back. 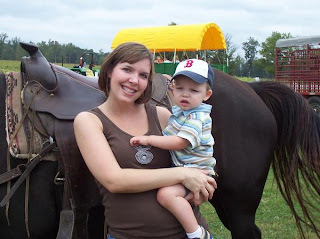 (shannon and i carpool and so i have not only 1 for trace, but caden and lala as well.) soon there will be 4!!! aauuggh!! i guess nothing's wrong with a mini-van, i just never thought i'd want one. now i can't see living without it! (and btw, nate is the coolest dad i know when he drives it! HA!!!) i love my momma van! 6. i think i have un-diagnosed A.D.D. wow, that must come as a surprise to any of you reading this blog. YEAH RIGHT! maybe it's worse when i am pregnant, but my mind just goes in 900 directions and so you may have a hard time following me. sorry! i usually try hard to get the point across though. in fact i usually do, sometimes more than once b/c i am repetitive. 7. and last... i HATE using correct grammar, capitalization, spelling, ETC! and i truly do apologize b/c i know several of you reading this are ENGLISH FREAKS! i just get to typing so fast and again, my mind is in a million directions, so it just comes out like it does. i guess a lot of it is laziness. but i'm out of school, don't plan on going back and hope that noone judges my character by this flaw of mine :) sometimes i try hard to be all correct and stuff, but i probably don't succeed even then :) also, i'm sure you've noticed but i use "..." WAY TOO MUCH! another sign of my A.D.D.?? i think so. 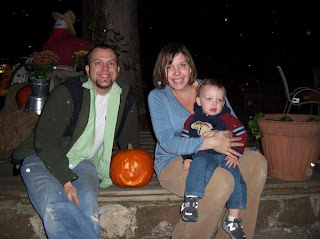 so we got together last week and carved our pumpkins! it was chilly, but fun! mom had everyone over and decided to keep things outside. 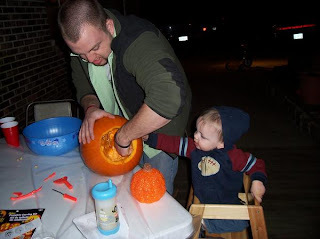 what a good idea, b/c boy those pumpkins were messy!! 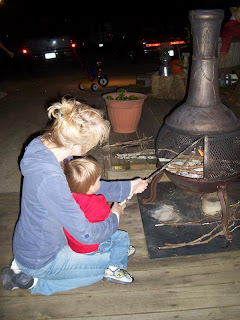 we had the firepit to keep us warm... and we also roasted marshmellows in it and made smores! YUMMY!!! 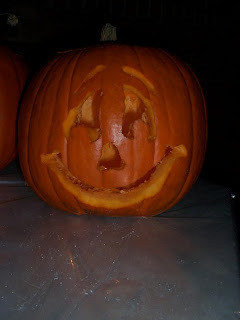 nate did a GREAT job carving our pumpkin, i will admit he did ALL the dirty work. i watched and of course, took pics! 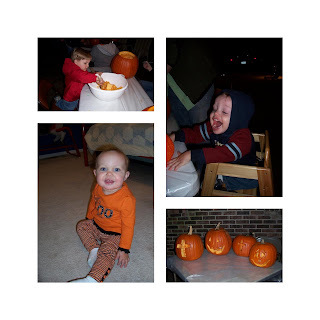 we had a great time and i love the way our pumpkin turned out so cute. we bought a $4 pumpkin carving kit from walmart... i think it was worth the money. i chose this cute little design and nate did all the carving. i think he did a great job... he couldv'e handled a much harder design but we were kinda pushed for time, it was getting close to trace's bedtime! 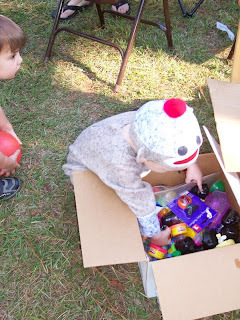 we enjoyed another fall festival at the church on sunday. 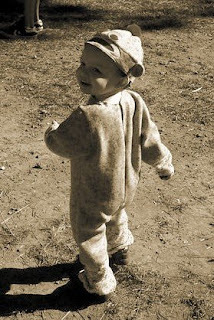 by now trace is used to his monkey costume and he loves it! he even kept the hat on, which i thought he would hate. his velcro tail kept coming off, so i finally put it in the candy bucket so we wouldn't lose it. trace loved running to all the different booths. we tried to get him to play each game, but instead he would go strait to the prize box and start digging through them. it was so funny! he managed to pick out a tiny little matchbox car from each box, he dug deep down to the bottom and wouldn't you know, he'd have a huge smile on his face and pull out a car! he'd show them to us like he had found a million bucks! he also got a toy "saur-saur" (dinsoaur) that he was pretty impressed with. while he was digging thru the prize box, i was going strait for the good stuff - THE CANDY :) surprise surprise!! 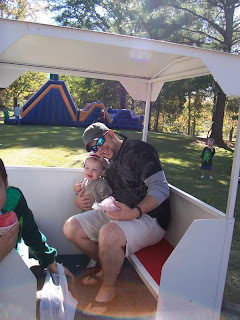 he also rode the train with daddy, ate a hot dog and cotton candy, jumped in the jumpy thing with caden, and went down the inflatables! long, but fun day! oh, and he was cracking me up b/c at poppi's basketball booth, he wanted to get IN the booth and roll around with all the basketballs! what a nut! chris and lacy also had their cute lil puppy sundance at the church and trace LOVED him... he was rolling around getting all kinds of kisses! I LOVE THIS PICTURE! how cute is he??? 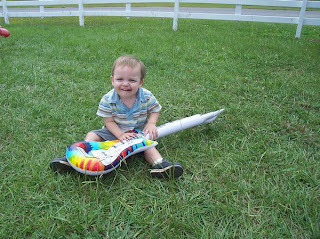 i guess by now i should be used to the fact that after trace plays outside for even 5 minutes, he stinks!! i always say he smells like a dog!! ( i know, he's just a BOY!!!) so as soon as we got home from the fall festival, he got a bubble bath! 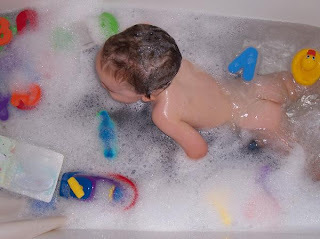 he LOVES to play in the tub. i got a few cute shots of him... i love the one above where is he cheesing so big! and i couldn't help but take the hiney shot below!! love this baby, esp. when he's clean! do you ever wish you could bottle the scent of your baby when he's fresh out of the tub? 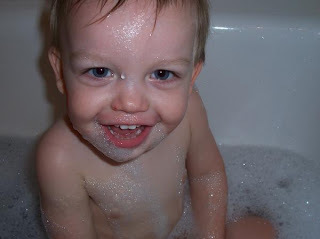 if i'm lucky, he still smells so sweet and clean the next morning too :-) gotta love Johnson's bath time products! and LAST but not LEAST... after his bath, nate had some fun spiking trace's hair. WHAT A WILD MAN! i love trace and his big ol' smile... no matter what's been going on, or how my day has been, i can always look at him, or just a pic, and it puts a smile on my face! Psalm 118:24 " This is the day that the Lord has made; let us rejoice and be glad in it!" 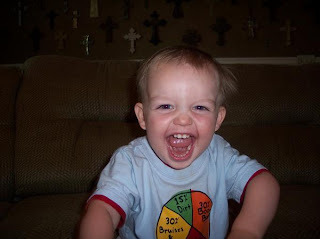 Looks like Trace has the rejoicing down to a T! I can hardly believe that Laura Grace is one now! 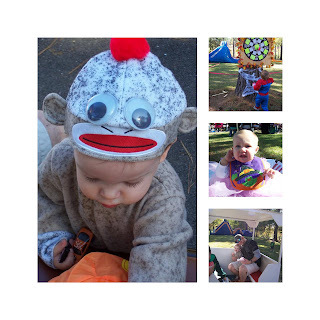 PRINCESS LALA celebrated her 1st birthday on sunday, oct 19, with a costume ball. it was so fun! she looked adorable. 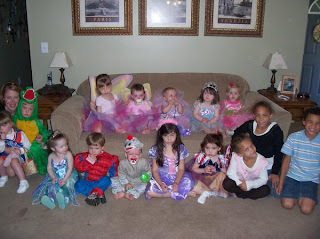 all the kids got to wear their costumes... it was such a great idea for a birthday so close to halloween. and as you see, lala was the prettiest princess there! 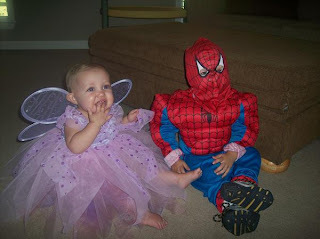 caden was spiderman, trace (of course) was the cutest lil sock monkey ever, and kenley was a fairy princess. there were 15 kids in all... which equals a ZOO. especially when you try and take a group shot. 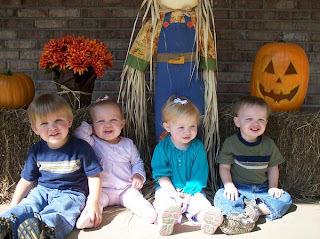 out of 15 kiddos, only 3 smiled for the group picture, and those 3 did not have costumes on. now we know why the kids were so unhappy: they were being tortured in their cute BUT itchy, hot, fru fru halloween costumes! LaLa LOVED the cake part... noone had to help her along! she dug into the icing the minute it was set in front of her! eventually she found the cake and loved it too. even when shannon was taking her to the bathtub, she was still sucking icing off her fingers. it was so funny! her party was 100% PINK and i loved every bit of it. 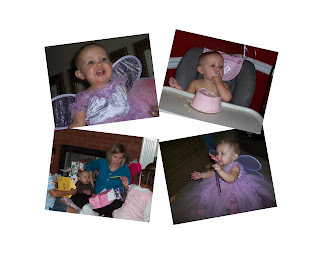 she got a ton of cute pink outfits, baby dolls, all sorts of girly girl gifts. 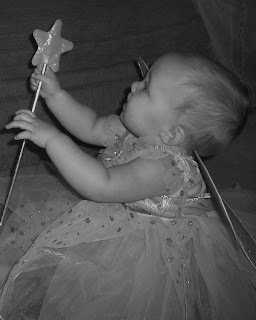 thank you lord for my sweet nieces that i can spoil... b/c i don't think trace would like me to buy him pink and brown dresses with adorable lacy tights and headbands to match :) he might not mind if i bought them, but i know he would hate for me to play dress up with him as the model! Not everyone can say their big brother is spiderman! caden played the part well... throwing his hands up and "tssss"-ing his web powers at all the guests. 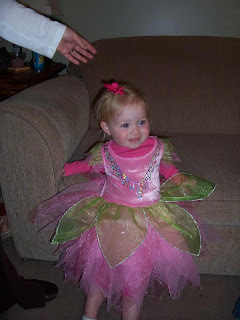 Kenley was too cute in her fairy princess costume! 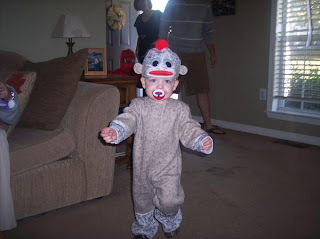 Trace ran in the front door and headed strait for meme, who was ready with the camera :) have you ever seen a monkey with a passy? at least it matched the outfit. ha. 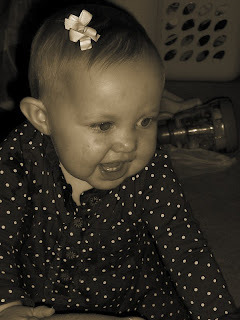 What a big girl... hard to believe she is one! LaLa is the cutest little thing... we love her and thank God for her! 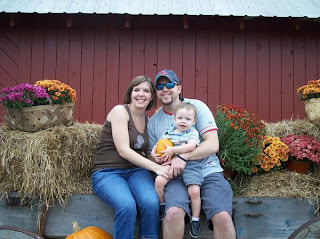 so we went to the pun'kin patch on saturday... and it was so much fun! 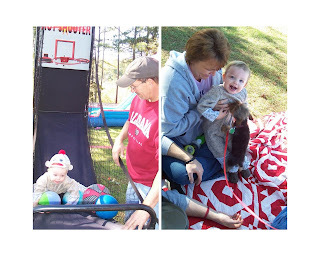 meme and grandaddy loaded all the kiddos in their van, and nate drove the parents in our van. our first stop once we got there was the petting zoo! 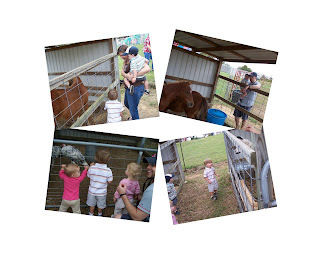 there were chickens, cows, a pig, a llama looking thing, sheep, and trace's favorite - "horsies!!" it was so neat b/c the kids all know the different animal sounds, but to hear a real pig "oink" and the horsies "neigh" was hysterical to see the looks on the kids faces!! 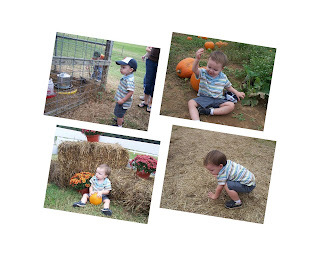 trace loved the pumpkin patch the most... although i think he tripped over almost every pumpkin and vine out there! 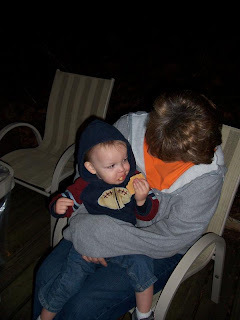 he loved sitting and playing in the dirt with sticks or whatever he could find. 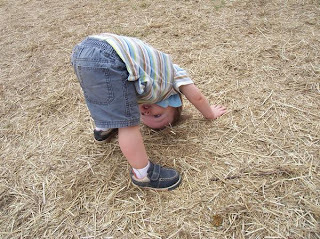 at one point he was doing headstands in the hay. it was so funny!! i have to remind myself - he's a BOY and dirt (or hay) won't hurt! 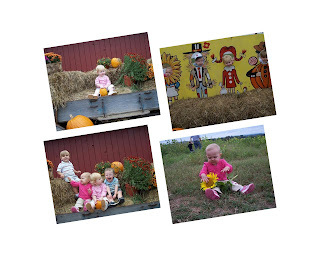 just having fun at the pumpkin patch! 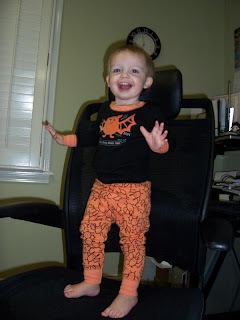 oh yeah, i couldn't resist these cute halloween pj's for $5.99 at oldnavy.com... def one of my weaknesses these days! 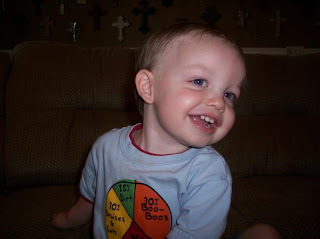 trace's new favorite saying is "TA-DA" after he does a trick! 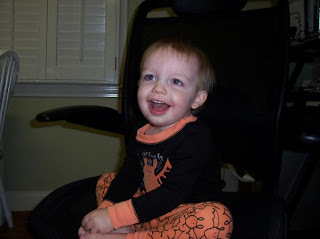 so here he is standing up in the rolling office chair scaring me to death. but i got the cute pic! in other news... we are just keeping busy and counting down the days til we meet lil lucas! only 117 days left til my due date... but when i went to the dr last week i asked if they would induce if i havn't had him by jan 30 and he said yes! YAY!!! there is an end in sight, only a little more than 3 months. wow. my belly is getting bigger by the day. i may post new pics soon. the way i see it, it will be halloween, then thanksgiving, then christmas, and then i will be having another baby before we know it! (let's hope it goes by that fast!) i got a great report at the dr, lucas was kicking and moving so much it was hard for them to chase him down and get his heartbeat. but all is well! i go back in 3 weeks for the sugar test, can't wait! i just love this baby boy! 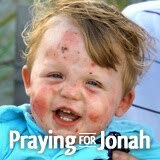 JOSIAH IS GOING HOME TODAY! Praise the Lord!!! ok, now for the pics... meme is getting better at the ones with all 4 kids... or maybe they are just cooperating more :) i LOVE this one. it is so sweet. they are all looking and smiling... and squinting! the sun was bright!! don't they look like brothers and sisters and not just cousins? of course caden and lala are bro and sis, and yeah, they look just alike! can't wait til trace's baby brother and kenley's brother or sister get here!! just being so cute... and SILLY!! 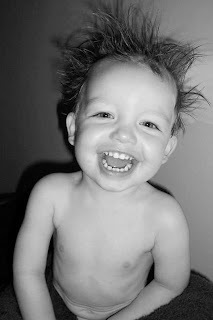 ok... the last is one of my new all time favorite pics of my lil man. 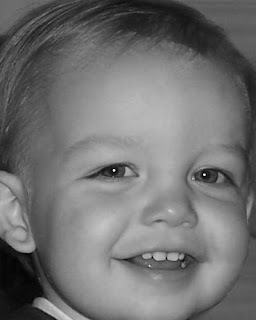 look how grown up trace looks in this black and white. just too precious. before you were an hour old i would die for you. this is the miracle of love." i love you sweet trace carter.